Written on 27 September 2016 . On September 25, we lost a legend. MG Orender, President of Hampton Golf and 33rd President of the PGA, wanted to take a moment to remember Mr. Palmer and share some of his experiences with him over the years. I grew up in the late 50s and 60s and the two biggest sports icons I clearly remember are Mickey Mantle and Arnold Palmer. Though our family did not play golf or even take it up until the mid-1960s, my father was fascinated by Arnold Palmer - a guy just like him from a blue collar background and coal mine country who took the world of golf by storm. 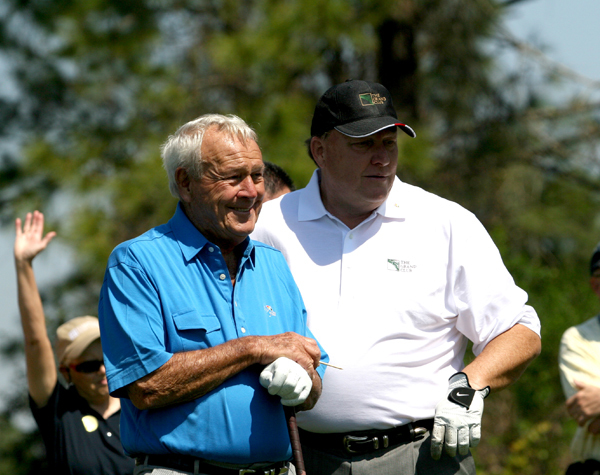 I couldn’t have dreamed that through my career, I would get to spend time with Mr. Palmer over the years. Out of all my memories of him, two events stand out in my mind that sum up exactly who he is and why he is “The King." The first event happened when I met him for the first time. That encounter was at the Senior Event in Tampa where he played each year, especially in the early days of the Senior Tour, when it was really a series of exhibitions. I ran the scoring tent for the North Florida Section and one day Mr. Palmer noticed me sneaking Chi-Chi out of the back of the tent. He asked me where that back door would take him and I told him to the back of the locker room. Mr. Palmer said he was tight on time so I slipped him out. The next day he thanked me and told me he owed me one. The following day my Dad was at the event. I asked Mr. Palmer to sign his card and I also asked if he would say ‘Hello.’ He got up, and asked me to point out my Dad. He was three people back from the rope. Mr. Palmer walked out, called him by name, shook his hand, pulled him through the ropes and talked about life in and around the coal mines of Pennsylvania and West Virginia. If I hadn’t been a fan before then, he definitely got my Dad and I for life that day. As time passed in my career and I continued to move through the chairs in the PGA on my way to being the President, I had the opportunity to spend time with Arnold Palmer and Ed Seay, and I also had the privilege of playing golf with Mr. Palmer on several occasions. In addition, his firm designed several courses for Hampton Golf which gave us other social and professional opportunities. Over the years, whenever I asked him to play in the Monique Burr Tournament, for an autograph for a friend or a charity, for a hand written note or to spend time with someone, he never said no.